Unfinished academic study showing a plan for a symmetrical building with five-bay portico leading to a hall with two apses and circular columned rooms beyond, and two oval staircases. You are here: CollectionsOnline / Unfinished academic study showing a plan for a symmetrical building with five-bay portico leading to a hall with two apses and circular columned rooms beyond, and two oval staircases. Like Adam vol.55/171 extra this drawing is on one of the sheets of the album and has no ink number. The elevational scheme mounted on this sheet, Adam vol.55/179, has not been superimposed on any drawings, which suggests that it was added later to a blank top of the sheet. 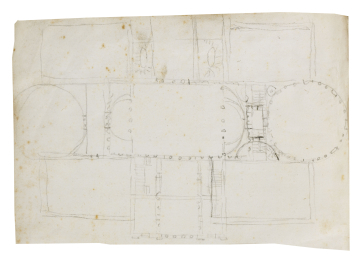 The plan itself is similar to Robert Adam's scheme for a music pavilion in Adam vol.55/173 verso, which incorporates several of the chalk alterations shown here.